Unlike CT, which requires ionising radiation, MRI is based on the interaction between radio waves and hydrogen nuclei in the body in the presence of a strong magnetic field. There is no ionising radiation and no known safety issues. MRI produces higher quality images than CT. In CT scans must be in the plane of the gantry, that is, axial or semi-coronal. 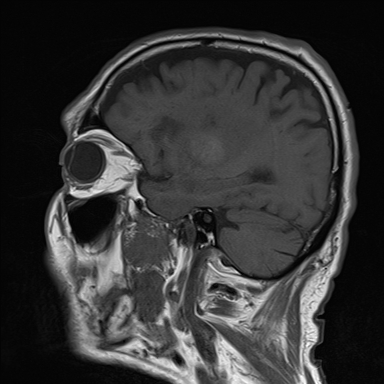 In MRI, one is able to acquire images directly in any plane, that is, the usual axial, sagittal, coronal, or any other. Both modalities focus on the properties of a volume element or "voxel" of tissue. This is represented in 2-D form or picture elements or "pixels". The pixel intensity in CT reflects the electron density but in MRI it reflects the density of hydrogen, generally as water (H20) or fat. To be more exact, MR signal intensity reflects the density of mobile hydrogen nuclei modified by the chemical environment, that is, by the magnetic relaxation times, T1 and T2, and by motion. A hydrogen nucleus is a single proton. It has a positive charge and spins and so generates a small magnetic field (a "magnetic moment") which are usually randomly distributed. These magnetic moments align when placed in a larger magnetic field. With MRI the magnetic field across the body-sized sample is intentionally made non-uniform by superimposing additional magnetic field gradients that can be turned on and off rapidly. Activation of these additional magnetic fields results in a net gradient in the strength of the magnetic field across the body which is necessary for spatial localisation and imaging. The essential components of an MR imaging system include a large magnet which generates a uniform magnetic field, smaller electromagnetic coils to generate magnetic field gradients for imaging and a radio transmitter and receiver and its associated transmitting and receiving antennae or coils. In addition to these fundamental components, a computer is necessary to coordinate signal generation and acquisition and image formation and display. When the body lies within a strong magnetic field, it becomes temporarily magnetised. This state is achieved when the hydrogen nuclei in the body align with the magnetic field. When magnetised, the body responds to exposure to radiowaves at a particular frequency by sending back a radiowave signal called a "spin echo". This phenomenon (NMR) only occurs at one frequency (the "Larmor frequency") corresponding to the specific strength of the magnetic field. The spin echo signal is composed of multiple frequencies, reflecting different positions along the magnetic field gradient. When the signal is broken into its component frequencies (by a technique called a "Fourier Transform"), the magnitude of the signal at each frequency is proportional to the hydrogen density at that location, thus allowing an image to be constructed. Thus, spatial information in MRI is contained in the frequency of the signal, unlike X-ray-based imaging modalities such as CT. Brain MRI usually involves lying within a very tight space for between 10 and 30 minutes. Access to the patient is difficult. It is incredibly noisy and communication with radiographers is difficult. One has to be realistic and consider the shortest protocol that will get the important clinical information needed. Some do not tolerate it at all. It is a common paradox and frustration that those in whom it would be of most value can't have one due to one reason or other. There are some open scanners available for those who are claustrophic but access is often difficult. Pacemaker/AICD or recent surgery and clips or metallic foreign bodies. This is the MRI equivalent of CT with contrast and uses Gadolinium which shortens T1 relaxation times. It is useful when there is suspicion of neoplastic, inflammatory lesions or abscesses. Also useful for detecting meningeal disease. It is not often used in acute stroke unless the diagnosis is in doubt. T1 relaxation time: Time taken for 63% of longitudinal magnetisation to recover in a tissue. T1 is short in fat and long in water and proteins. Contrast causes T1 shortening. T2 relaxation time: Time taken for 63% of transverse magnetisation to be lost in a tissue. Liquids have long T2 and large molecules a short T2. T2* based on T2 decay and dephasing due to inhomogeneities in the magnetic field. Relevant in Gradient echo imaging. Dark : CSF and anything with increased water (oedema, tumour, infection, infraction, haemorrhage or flow void or calcification). Bright: Fat, subacute haemorrhage, melanin, protein rich fluid, slow flowing blood, gadolinium, laminar necrosis of an infarct. White matter is brighter than grey. Myelin is light grey. Grey matter is grey. T1 is better for showing anatomy. An acute stroke will be hypointense. Dark: Calcification, Blood products, protein rich fluid, flow void. Bright: Anything with increased water e.g. CSF, Oedema, tumour, Infarct, inflammation, infection, subdural collection, methaemoglobin in subacute bleed. 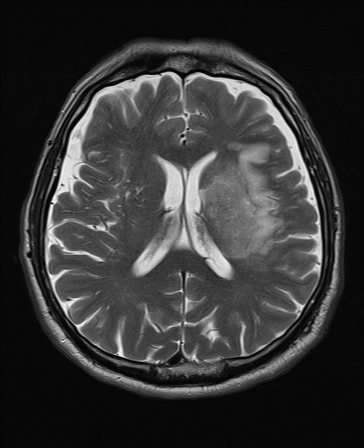 CSF is white and brain tissue is darker and more intermediate. Fat is dark. Myelin is dark grey. Grey matter is brighter than white matter. Good for identifying pathology. T2 is bright due to water or any oedema in pathology. For example a fresh infarct with oedema will show up bright or hyperintense after a few days becoming most obvious after a few months. T2 weighted hyperintensities may be seen within 6 hours and are present in 90% by 24 hours. Mostly used to detect iron in its various forms. Haemorrhages cause an influx of hemoglobin and hemosiderin into the lesion. The iron in haemoglobin and haemosiderin is paramagnetic and thus causes an susceptibility difference in the damaged region, which shows up as dark regions in T2* scans. Blood looks black and Hemosiderosis can also be detected by T2* scans for the same reason. Calcification shows up bright in a T2* MRI due to its higher diamagnetism than the surrounding tissue. FLAIR scans are T2 scans with the free water signal nulled. CSF is now dark. 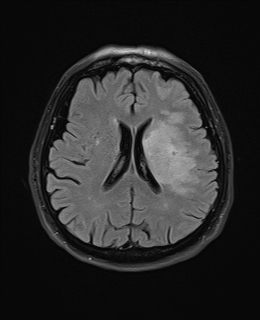 Useful to see oedema and periventricular lesions which appear bright. Excellent at identifying areas of blood and haemosiderin deposition such as in macrophages around an old bleed. Also useful in identifying microbleeds. Sensitivity for blood approaches CT within first 24 hours of a bleed. After several days GRE is the more sensitive modality. Identifies areas where Brownian motion is restricted due to cytotoxic cell death. Useful for identifying early Ischaemic stroke. This is explained by loss of ATP causes of ion exchange pumps. Water from the extracellular space enters into the intracellular compartment (cytotoxic oedema) and produces a typical bright spot on DWI. These changes are seen even within 30 minutes. A new stroke is bright but an old stroke will have low signal intensity on DWI. The DWI is initially bright white and then gradually fades after 10-15 days when the lesion will be best seen on T2 and FLAIR. The ADC often shows the inverse and is black. The signal intensity of acute stroke on DW images increases during the 1st week after symptom onset and decreases thereafter. The ADC map shows a similar findings. Used with DWI. Ischaemic lesions appear dark.If bright this may suggests the DWI increased signal changes are due to T2 shine through and old i.e. false positive. Identifies pathology in which there is breakdown of the blood brain barrier. Also useful in producing an angiogram. Tumours or other lesions may show ring like enhancement. 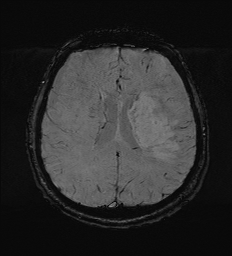 T1 with Gadolinium will show increased signal with a pituitary tumour, acoustic neuroma or meningioma. T2 Weighted Imaging and FLAIR show increased signal 'bright' which peaks at 7 days and may persist for a month. Diffusion weighted imaging is the most sensitive sequence for acute ischaemia as it shows the diffusion restriction (reduced brownian motion) of extracellular water due to imbalance caused by cytotoxic oedema within minutes. It can remain bright for up to 3 weeks. Some of the bright area may be viable. Vasogenic oedema can also give a bright appearance. Chronic Infarction is not bright on DWI. ADC map is initially 'dark' low signal with cytotoxic oedema (acute ischaemic stroke) and then increases in signal later on. Vasogenic oedema increases water diffusion and gives a bright appearance on the ADC map and this is called 'T2 shine through'. With time the DWI shows decreased signal intensity and the ADC shows increased ADC values. Gradient echo or T2 star It may also be useful in the very early detection of acute thrombosis and occlusion involving the middle cerebral (MCA) or internal carotid artery (ICA). This may show as a hypointense (dark) signal within the MCA or ICA, often in a curvilinear shape. Note that the diameter of the hypointense signal is larger than that of the contralateral unaffected vessel. This finding is called the susceptibility sign, and it is analogous to the hyperdense MCA sign described for CT imaging. 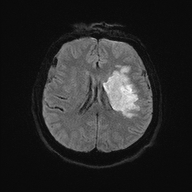 Perfusion weighted imaging requires fast MRI techniques to quantify the amount of MR contrast agent reaching brain parenchyma after an IV bolus. Allows construction of maps of cerebral perfusion. This can show ischaemic zone. Multiple areas white matter T2-hyperintensity and lacunar infarctions concentrated in the anterior temporal lobes and in the deep white matter of the frontal and parietal lobes. There is relative sparing of the occipital lobes. Anterior temporal pole and external capsule lesions have higher sensitivity and specificity for CADASIL. A DSA is typically normal not identifying any significant large vessel disease. The Digital subtraction angiogram or CEMRA shows lumen irregularities in distal cerebral arteries. Lesions are most prominent in the parieto-occipital region and basal ganglia. Lesions have a migrating pattern over time, with appearance, disappearance, and reappearance. Variable degrees of generalised cerebral and cerebellar atrophy may also be seen. Basal ganglia calcifications may also be seen. CTA and MRA are usually normal. DSA in the acute phase may show dilated cortical arteries with prominent capillary blush and no arterial occlusion. Focused predominately in the cortical and subcortical grey matter of the parietal and occipital regions but may also be seen in frontal and inferior temporal-occipital junction and cerebellum. DSA has shown diffuse vasoconstriction as well as focal vasoconstriction, vasodilation, and even a string-of-beads appearance consistent with vasospasm or arteritis. There is reduced brain perfusion in regions of PRES. Location of Bleeds in putamen, thalamus, and pons. 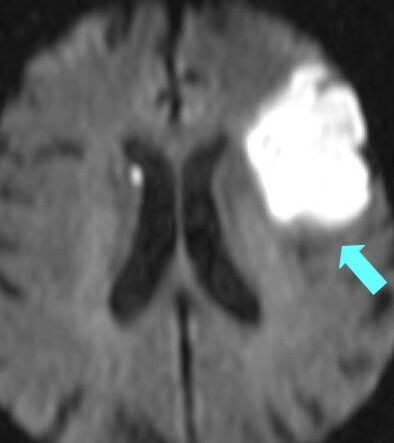 Haemorrhages more likely to occur in the temporal and occipital than the frontal and parietal lobes and sites of previous bleeds. There was a slight bias for the posterior circulation. Cerebellum can also be affected. All ventricles are modestly dilated.